(CHARLOTTE, NC – October 8, 2014) What’s not to love about this minivan? The Toyota Sienna is the minivan like no other – delivering all the practicality that busy Canadians demand, plus great styling and the surprisingly dynamic performance that drivers love. For 2015, Toyota offers the Sienna in several models – including Canada’s only all-wheel-drive minivan models – making it easy for drivers to choose the minivan that best meets their needs. And when a one-way conversation is just what you need, Toyota’s Driver Easy Speak (now available on the 2015 Sienna), let’s everyone in the back can hear how much fun the driver is having. With starting MSRPs as low as $31,040, there’s never been a better time to put a Sienna in the driveway. A pull-down conversation mirror as standard on all models. First offered with the 2014 Toyota Highlander, the now-famous Driver Easy Speak system is available, which uses a built-in microphone to amplify the driver’s voice through the rear speakers, so that everyone can hear; of course the conversation only goes one way! Other standard features that set all Sienna models apart include: three-zone independent automatic climate control; one-touch folding third-row seats for easy stowing; ECO indicator; power windows with auto up/down function on all windows; rear privacy glass; steering wheel-mounted audio controls and voice recognition controls; three onboard 12-volt DC accessory power outlets; cruise control; power door locks with keyless entry; dual sliding side doors; dual power adjustable and heated exterior mirrors; the automatic headlamp system; a rear spoiler; and more. All Sienna models are built around a powerful and proven 3.5L V6 mated to a six-speed automatic transmission for easy driving, smooth acceleration, and maximized fuel efficiency. This beautifully appointed, seven-passenger Sienna has been enhanced for 2015 with a 7-inch Display Audio screen, heated steering wheel, and the Blu-Ray rear-seat entertainment system with 16.4-inch wide screen monitor and two sets of wireless headphones. These join a long list of standard features, including: a 10-speaker JBL Synthesis Audio System; a navigation system; premium leather seating; the Toyota Smart Key System with power back door button and Push Button Start; LED Daytime Running Lights; the Driver Easy Speak system; power adjustable front seats; second-row captain’s seats with lounge seating (ottoman) function; power flip-out side rear windows; front windshield acoustic glass; woodgrain interior trim and sliding wooden front console box; wood-grain and leather-wrapped, heated steering wheel; driver’s seat memory system; clearance and back-up sensors; the Blind Spot Monitor and Rear Cross Traffic Alert systems; anti-theft system; 18-inch aluminum alloy wheels; 120-volt accessory power outlet; wide-angle back-up camera; dual power moon roof; power folding mirrors linked to seat memory system and with reverse auto-tilting function; rain sensing wipers; automatic high beams; LED Daytime Running Lights; fog lamps; dual power sliding rear doors; High-Intensity Discharge headlamps with the automatic high beam system; chrome grille; and more. Also a popular model, this seven-passenger Sienna brings together comfort, style, technology and the added all-weather confidence of on-demand all-wheel-drive. With no increase in starting MSRP, the XLE receives new standard features for 2015, including: The Toyota Smart Key System with power back door button and Push Button Start; LED Daytime Running Lights; and a navigation system. These join a long list of standard features, which include: Toyota’s 7-inch Display Audio system with XM Satellite Radio, advanced voice recognition, Bluetooth capability, and more; the Driver Easy Speak system; genuine leather seating; power adjustable front seats; second-row captain’s seats; power flip-out side rear windows; front windshield acoustic glass; woodgrain interior trim and wooden front console box; leather-wrapped steering wheel; back-up sensors; the Blind Spot Monitor and Rear Cross Traffic Alert systems; anti-theft system; 18-inch aluminum alloy wheels; a power moon roof; LED Daytime Running Lights; fog lamps; dual power sliding doors; and more. This model may be enhanced with an available Limited Package, which adds: wood-grain and leather-wrapped, heated steering wheel; JBL Synthesis audio system; the new Blu-Ray rear-seat entertainment system with 16.4-inch dual-screen monitor; premium leather seat surfaces; driver’s seat memory system; clearance and back-up sensors; 120-volt accessory power outlet; wide-angle back-up camera; dual power moon roof; power folding mirrors linked to seat memory system and with reverse auto-tilting function; rain sensing wipers; High-Intensity Discharge (HID) headlights with the automatic high beam system; and more. This popular eight-person Sienna features a sport-tuned suspension and power steering systems for added driving fun, plus bold styling with a sport grille, sport front and rear fascia, 19-inch aluminum alloy wheels and more. New for 2015, the SE is now standard equipped with: genuine leather seating with contrast stitching; heated front seats; Toyota’s 7-inch Display Audio system with XM Satellite Radio, advanced voice recognition, Bluetooth capability, and more; and LED Daytime Running Lights. Other standard features include: power-adjustable front seats; sport instrumentation gauges; leather-wrapped steering wheel; chrome door handles; fog lamps; a smoked headlamp surround; LED tail lamps; dual power sliding doors; and more. This model may be enhanced with an available Technology Package, which adds: the new Blu-Ray rear-seat entertainment system with 16.4-inch dual-screen monitor; the Driver Easy Speak system; a navigation system; Blind Spot Monitor and Rear Cross Traffic Alert systems; the Toyota Smart Key System with power back door button and Push Button Start; a power moon roof; and an anti-theft system. 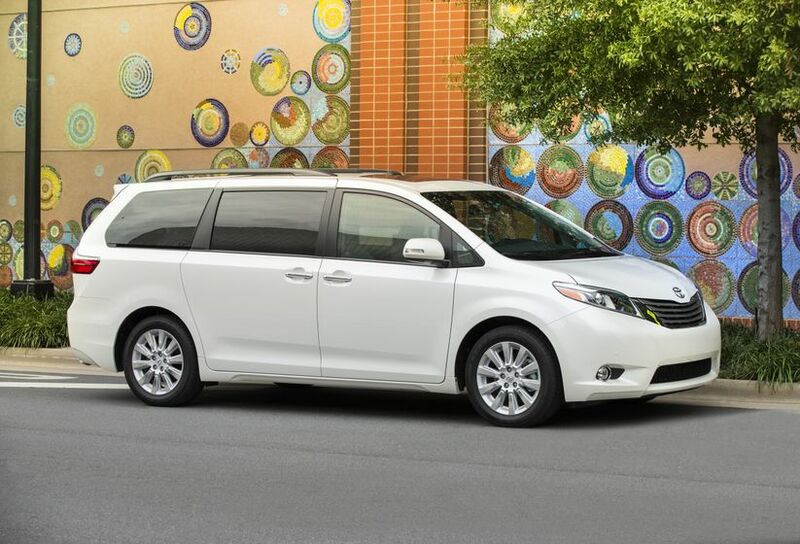 Available in eight-passenger front-wheel-drive or seven-passenger on-demand all-wheel-drive models, the Sienna LE is enhanced for 2015 with a 7-inch Display Audio system as standard. Other standard features include: easy clean fabric seats; power adjustable and heated driver’s seat; heated front passenger seat; electro-chromatic rear view mirror with integrated digital compass; a rear door sunshade; dual power sliding doors; 17-inch (FWD) or 18-inch (AWD) aluminum alloy wheels; chrome grille surround; rear bumper protector; and more. For 2015, this value-priced seven-passenger Sienna adds a back-up camera and 6.1-inch Display Audio system to an already impressive list of standard features. These include the standard features already listed for all Sienna models, plus: front and second-row captain’s seats; 17-inch aluminum alloy wheels; plenty of thoughtful in-cabin storage; locking glove box; front and rear splash guards; roof rails; and more. 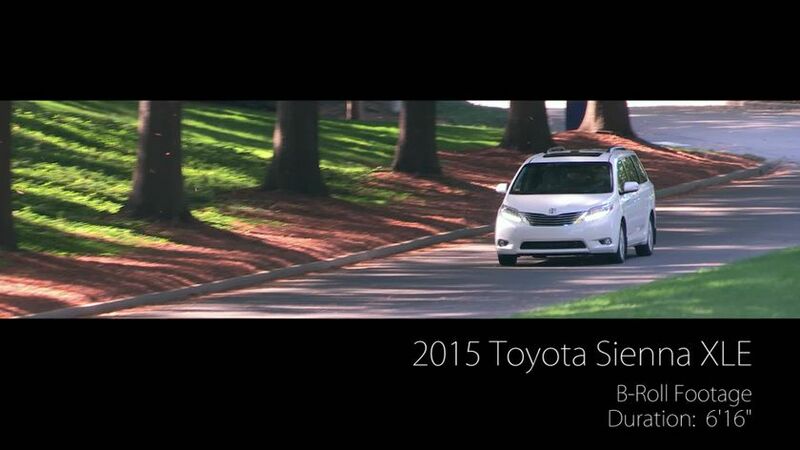 The 2015 Toyota Sienna is now on sale at Toyota Dealers across Canada. For more information on features and specifications, visit www.toyota.ca/sienna.